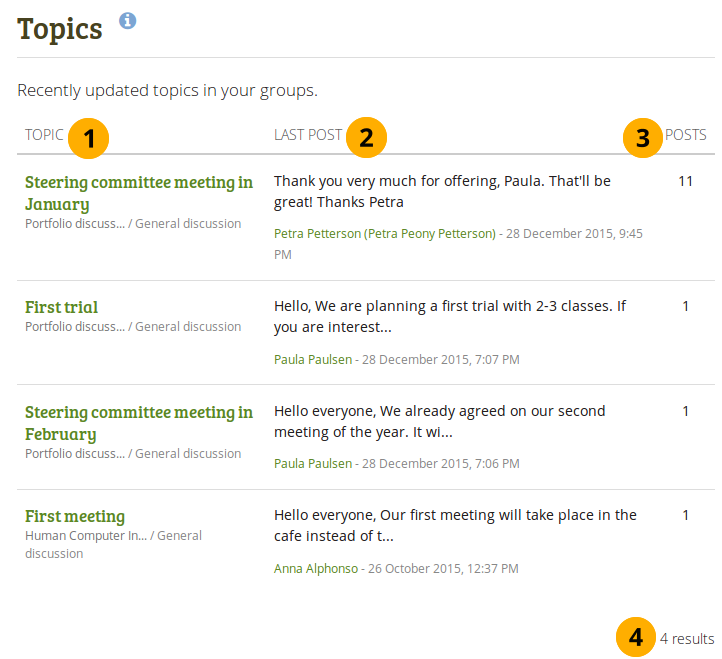 Topics is a list of the discussion topics from all the groups in which you are a member. The topics are sorted in reverse chronological order starting with the latest comment. The title of the forum topic as well as the group and the forum in which this topic is discussed are shown. They are all linked so that you can easily go to them. The beginning of the latest comment in the topic is displayed as well as the name of the author (linked to the author’s profile page) and the date and time when the forum post was made. The number of posts in this discussion topic is displayed. The total number of forum topics is displayed. When there are many forum topics, 10 are displayed per page and the rest can be reached via a navigation bar.